Improve your ability to diagnose and manage pediatric orthopaedic conditions related to trauma, spine, hip, and foot and ankle. Deepen and update your understanding of infectious disease, metabolic disease, genetics, skeletal dysplasia, rheumatology, and neuromuscular disease – as well biomechanics of growth and development. • identify current concepts regarding the evaluation and treatment of children and adolescents with musculoskeletal trauma. 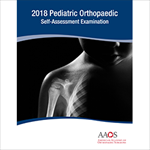 • describe the etiology, evaluation, and treatment of pediatric orthopaedic conditions. • optimize the diagnosis and treatment of children and adolescents with sports-related injuries. • recognize and successfully treat osteoarticular infections in the pediatric population while avoiding complications.